Proceedings of the symposium held February 24 through 27, 1999 Charlottesville, Virginia. 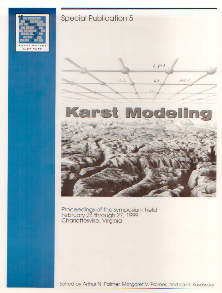 Recommended Citation: Arthur N. Palmer, Margaret V. Palmer, and Ira D. Sasowsky, Eds., 1999, Karst Modeling, Proceedings of the symposium held February 24 through 27, 1999 Charlottesville, Virginia. Karst Waters Institute Special Publication 5, Karst Waters Institute, Charles Town, West Virginia, 256 p.